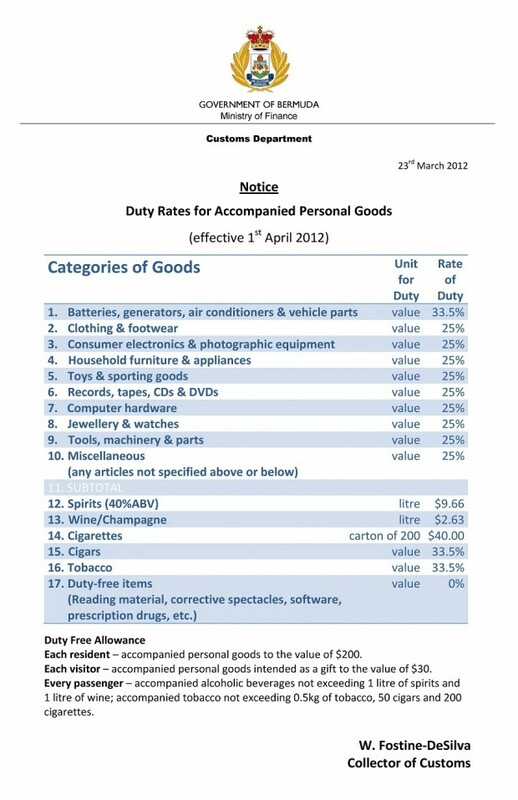 Effective April 1, 2012, the new standard 25% import duty rate for non-business goods applies, with each passenger receiving a duty free allowance of $200 per person. Special rates of duty, including zero-rate and higher rates, will remain unchanged. In November 2011, Premier Paula Cox formally introduced measures in Parliament increasing the rate of duty payable on accompanied goods imported for personal use from 25% to 35%, which was lowered back to 25% in April 2012. This information is valid as of Sept. 1, 2012.